After the iPhone X, iPhone 8 and ARKit launches, it’s clearer than ever that Apple owns the four waves of augmented reality. But Google’s launch of ARCore has the startup CEOs, corporates and VCs with whom Digi-Capital works confused (not to mention Facebook Camera Effects). While there are technical/performance differences between the platforms, they’re more alike than different from a UX perspective. But how much money they’ll make (and how they’ll make it) could be wildly different. To understand the differences, we’re going to dig into each mobile AR platform’s addressable markets, adoption rates, user bases, ARPUs, in-app purchases (“IAP”), premium apps, ad spend and e-commerce sales (as well as ROW versus China). Using hard data from OS/messaging feature adoption as a guide, the starting point is installed base (Note: this is installed base of devices for ARKit/ARCore and unique users for Camera Effects). Next year, ARKit could have 1.5x Camera Effects and 2x ARCore installed base. The simple reason for the difference is Apple’s massive iOS adoption rate, which together with new device sales could see more than 600 million iOS devices with iOS11/ARKit by the end of 2018. 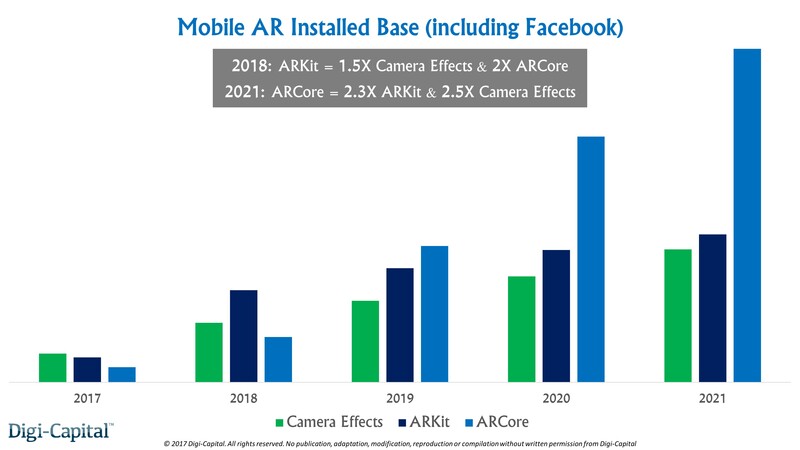 But different adoption curves across Android and Facebook’s Messenger, Instagram and WhatsApp might give ARCore 2.3x ARKit and 2.5x Camera Effects installed base by 2021. Only at that stage are we looking at more than 2 billion installed base for ARCore globally. So folks who got excited about Sundar Pichai’s 2 billion active Android devices having ARCore next year were just that — excited. ARCore’s addressable market is an order of magnitude smaller today, because of the fragmentation between different versions of Android across its installed base. Let’s leave Camera Effects for the moment (we’ll come back to it), and focus on ARKit and the fragmented ARCore market. ARCore is compatible with Android 7.0 Nougat and above, and will rely on Android OS adoption rates. Compared to iOS, new Android OS adoption is much slower with far lower penetration. This means that Nougat, Oreo and subsequent Android OS versions (which are ARCore compatible) might not be on half of all active Androids before 2019. Then ARCore compatible Android OS adoption should hit an inflection point due to natural device attrition and new device sales. But compatible Androids also need to be calibrated to ensure “a consistent bar for quality and high performance,” and Android phone makers might only do this to sell premium “ARCore-ready” phones. Today ARCore Preview is available on Google Pixel and Samsung S8, and Google has a job to do with Huawei, Oppo, Vivo and others to get them to calibrate their kit. While this may be more effective than what happened with Tango, there is the question of decoupling ARCore from Google Mobile Services with the Chinese market in mind. Tencent, Alibaba or Baidu could work with Chinese domestic phone makers to create their own “ARCore (China)” and freeze Google out, so Google will be hoping the force is with Clay Bavor. ARKit should be the largest single mobile AR platform next year, with 3.2x ARCore (Google Play — so ROW outside China) and 5.5x ARCore (China) installed base. 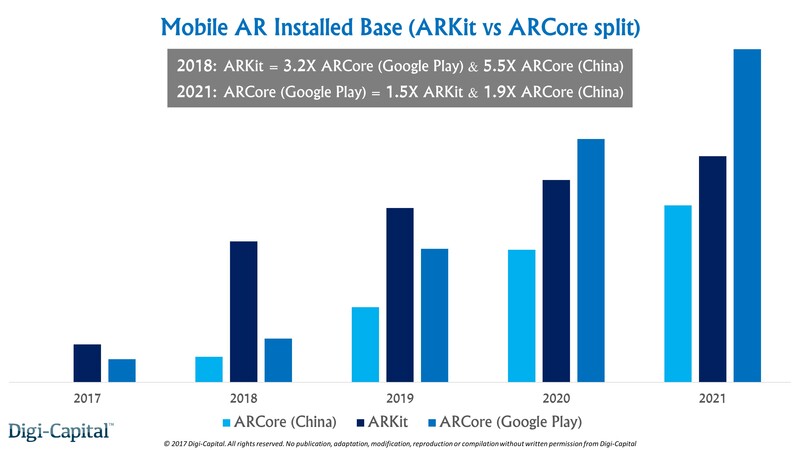 But by 2021, ARCore (Google Play) installed base of over 1.4 billion could be 1.5x ARKit and 1.9x ARCore (China). While there will be larger differences at individual country levels, global ARKit ARPU could be 1.9x ARCore next year. 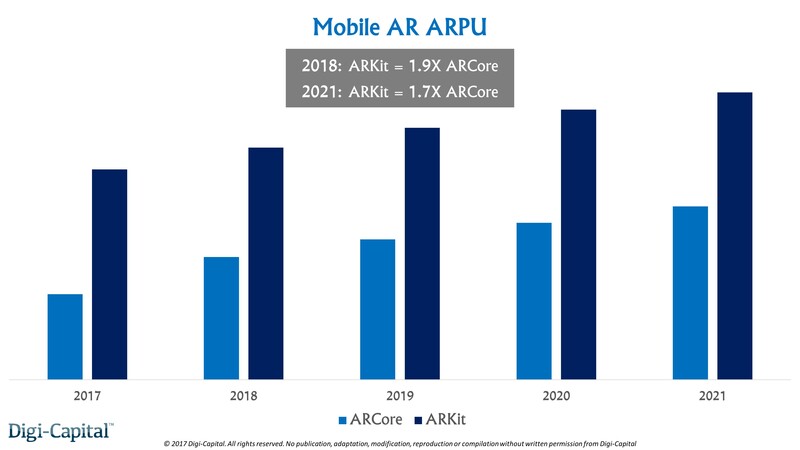 Even as ARCore plays catch-up on monetization due to a range of factors, ARKit ARPU might still be 1.7x ARCore ARPU by 2021. In practical terms, this means that developers will need to acquire two ARCore users to make as much money as a single ARKit user. The impact of this ARPU difference is that the best mobile AR developers with the stickiest mobile AR apps might launch on ARKit before ARCore. Some could bypass ARCore altogether (See early ARKit/ARCore/Camera Effects ratio in our comprehensive collection of hundreds of mobile AR apps). The knock-on effect of this dynamic could be the number of active ARKit apps per user on iOS being higher than their ARCore Android cousins. That’s a big deal, as the number of active mobile AR apps per user will drive monetization just as much as installed base and ARPU. 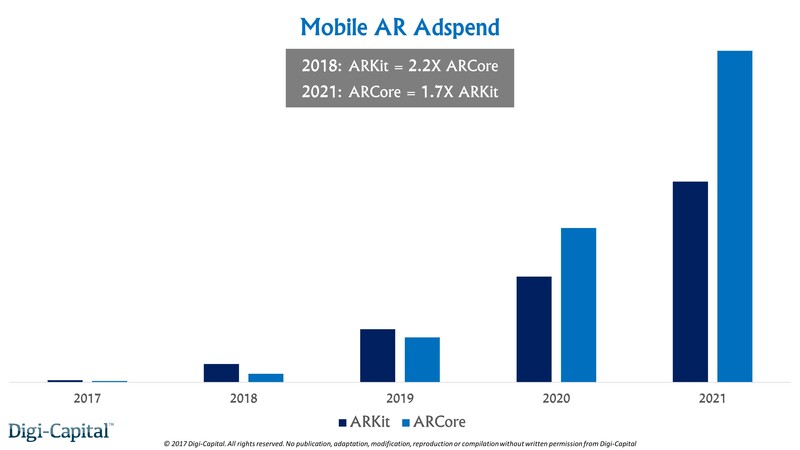 ARKit’s larger installed base and small advertising premium should deliver 2.2x ARCore mobile AR ad spend next year. But the weight of numbers could tip the balance in the long-run, with ARCore ad spend 1.7x ARKit by 2021. From a lower base in 2018, Camera Effects could emerge as the largest single mobile AR advertising platform globally by 2021. The installed base dynamic above is similarly helpful for e-commerce. 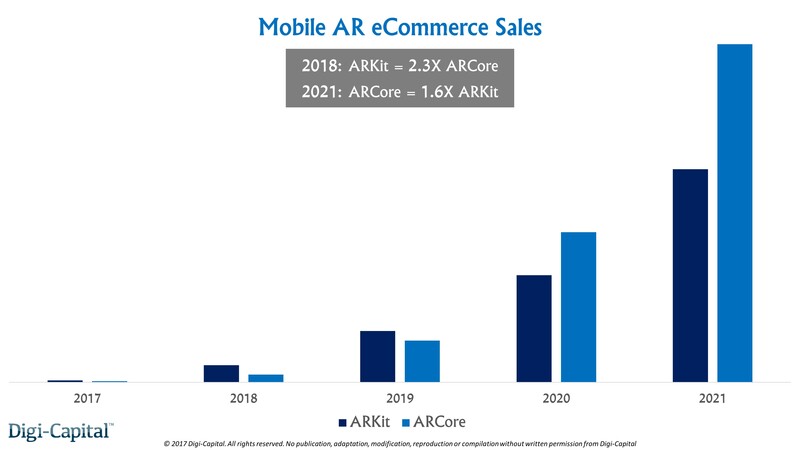 While ARKit’s larger installed base and slightly larger premium for e-commerce could give it 2.3x ARCore e-commerce sales (goods and services, not IAP) next year, this could flip to ARCore being 1.6x ARKit by 2021. The increased conversion rates from more immersive selling could help Amazon, eBay and Alibaba enhance their already dominant positions. 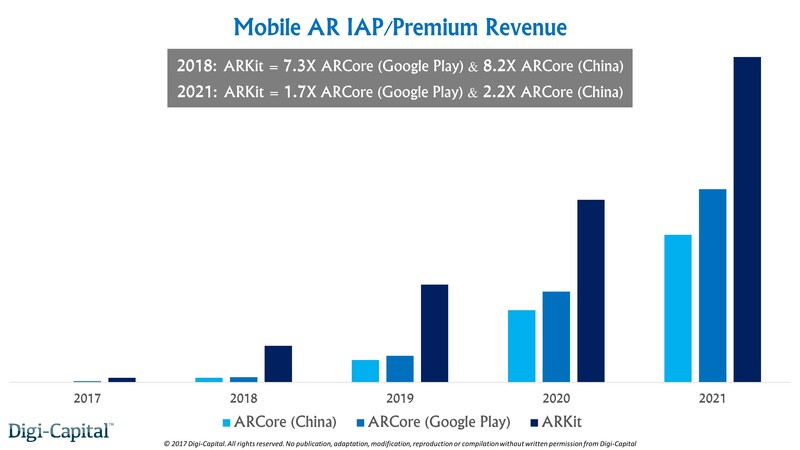 ARKit’s total consumer revenue (IAP, premium, ad spend, e-commerce) in 2018 could be 2.7x ARCore. It should remain the largest commercial platform the following year, too. 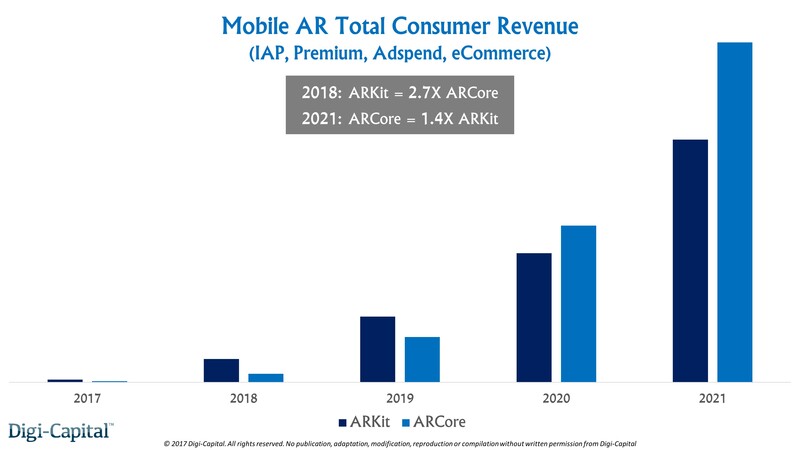 But from 2020 the tide turns, with ARCore hitting 1.4x ARKit total consumer revenue by 2021. For developers (and their investors) who make their money from IAP and premium apps, there is no contest. ARKit is by far the superior platform commercially today, and that’s not going to change any time soon. Developers who are successful on ARKit could see ARCore (and Camera Effects where relevant) as secondary platforms commercially. The one rider to this is the Chinese domestic market, where ARCore (China) installed bases will mean that a balanced approach with ARKit is required. For advertising related apps, media and advertisers, the commercial differences between platforms are not as stark. ARKit is probably the best place for early experiments, but a balanced approach including ARCore will reach the most mobile AR eyeballs. Given Camera Effects’ potential as a leading mobile AR advertising platform, it has to be part of the mix outside China. Snap’s Evan Spiegel has his work cut out to compete at the platform level. Lastly, mobile AR e-commerce developers, corporates and investors should also take a balanced approach to ARKit and ARCore. Early experiments on ARKit could yield better data to support full e-commerce roll-outs, but in the long run a sale is a sale no matter where it comes from. There’s one question I’ve asked for the last three years when mentoring CEOs, developing strategy for corporates or when VC firms have asked me to join them — what’s the catalyst for AR to scale? I don’t need to ask that any more.